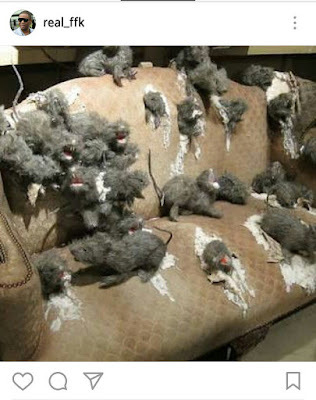 "Our members didn't vandalize Buhari's office" - Rat Association of Nigeria kicks. Rats Association of Nigeria (RAN) has refuted the Presidency's Allegation of Vandalism against their Members. Reacting to the allegation, the National chairman Rats Association of Nigeria (RAN) Comrade Ntapia O. Ntapia said "We respect protocols, our members don't cross National Red Lines. We are peaceful and law-abiding citizens as we are found in every home across the country. We therefore urge the general public and good people of Nigeria to please disregard the ridiculous and baseless allegation"
In a telephone chat with the Aso Rock coordinator of the Association Chief Tụfịakwa Kpokokpo, who also debunked the accusation as false and laughable, warned the Buhari's administration to desist from instigating Nigerians against them. "You could recall that sometimes last year, this same administration accused us of spreading Lassa fever in some parts of the country which later turned to be false after mass killing of our members. Now they have come again with another bunkum. We are fully aware that Buhari is doing everything possible to ruthlessly annihilate and exterminate us, but he will fail" he said.